A common misconception about Universal Orlando Resort is that the attractions at Universal Studios and Islands of Adventure are designed mainly with teens and adults in mind. Quite to the contrary, there are many rides, attractions, and activities for younger children (9 and under) to take part in and still have fun. 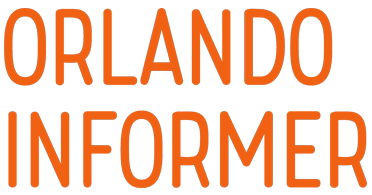 The OI Universal Center is proud to present you with everything you need to know about what is available for the younger crowd for both Universal Studios and Islands of Adventure. 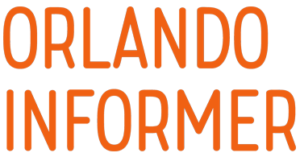 On this page, we will discuss Islands of Adventure. To learn about Universal Studios Florida, click here. The Adventure at Universal Orlando’s second theme park is not just for teens and adults! No siree, kids 9 and under will find more than a full days worth of excitement as they explore IoA’s six islands with their grown-up companions. 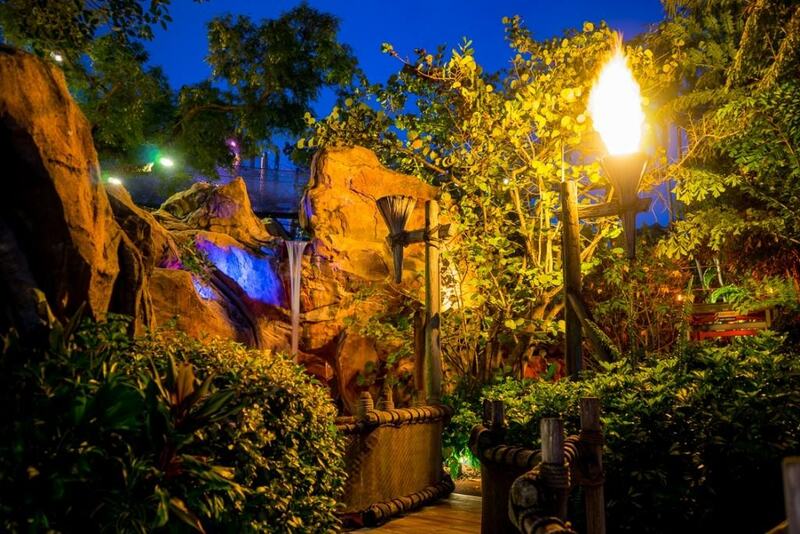 From the jubilee of Seuss Landing, to the caves of Camp Jurassic, to the enchantment of the Wizarding World, get ready to find pint-sized thrills around every (almost) every corner. 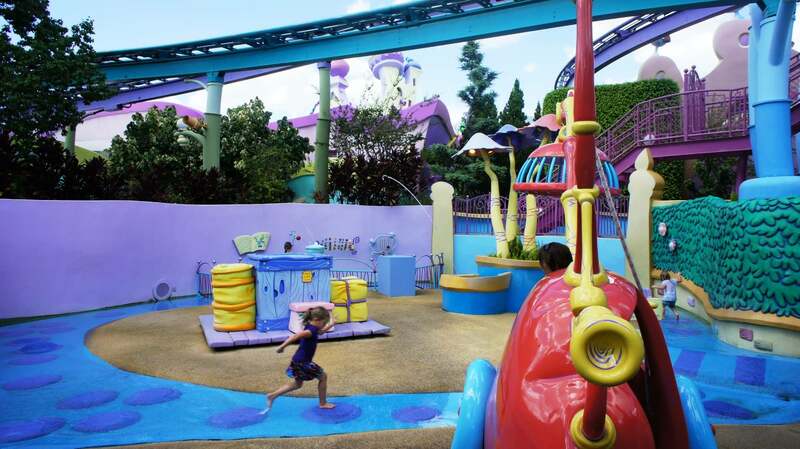 Similar to Woody Woodpecker’s KidZone at Universal Studios, Islands of Adventure has an entire section of the park designed with the younger crowd in mind called Seuss Landing. This area contains rides, attractions, shows, character greetings, shops, and snack areas based on Dr. Seuss’ books and stories. 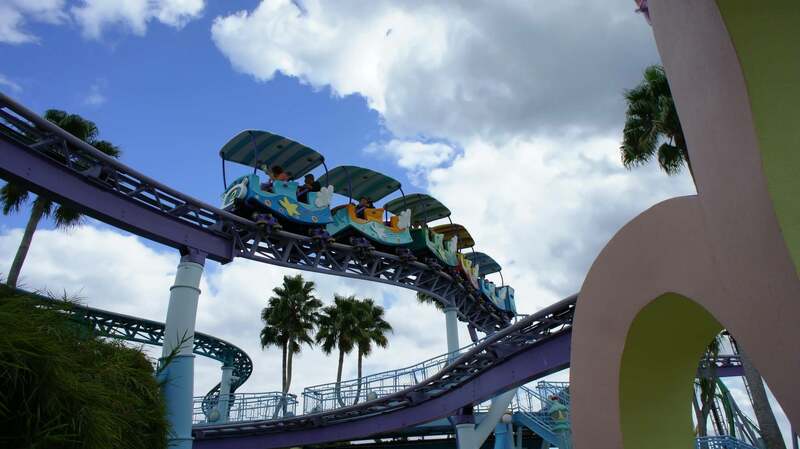 The first attraction in Seuss Landing is The High in the Sky Seuss Trolley Train Ride. This ride has a minimum height requirement of 40 inches. Express Passes are accepted here. Stroller parking is marked across the street. The Trolley Train gives you a bird’s eye view of Seuss Landing, along with an excellent view of The Hulk across the lake. This train ride has two different routes so you may want to ride twice to get the full effect of the ride. Two people sit per car, and there is a lap bar to hold you in your seat. Listen to the story as you ride along as it describes in a Dr. Seuss-style what you see while touring through Seuss Landing. As you are riding next to the lake, look down, and you will see Dr. Seuss characters enjoying themselves in the water. Nestled in Seuss Landing near the Caro-Seuss-el is The Street of the Lifted Lorax. 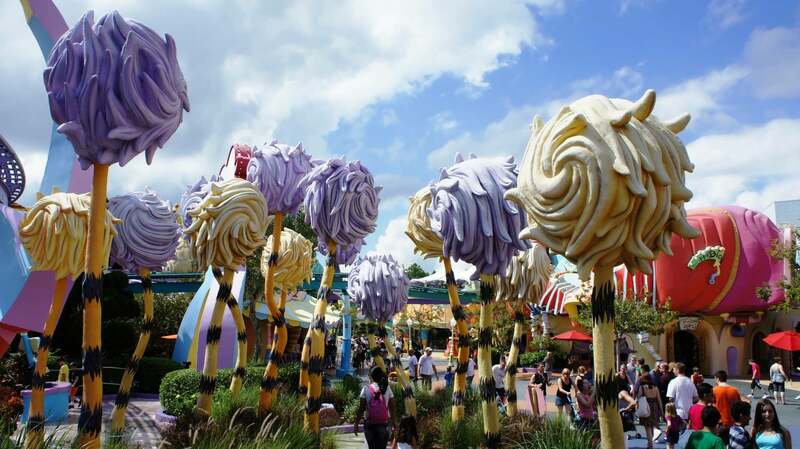 This is a thoroughly decorated walking path with Truffula trees and other familiar items from the Lorax, which make a great backdrop for photos. 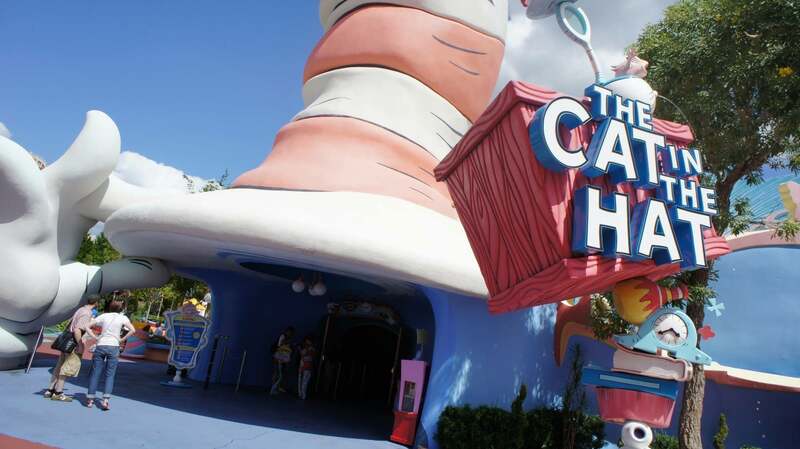 The next attraction in Seuss Landing is Caro-Seuss-el. Stroller parking is indicated near the attraction. Express Passes are accepted here. This carousel is a great attraction for all ages. You can ride a Seuss character or on a bench and watch the world spin by as you listen to fun music, which slows down as the carousel slows down. All riders, no matter what age, must use the belt to secure themselves. 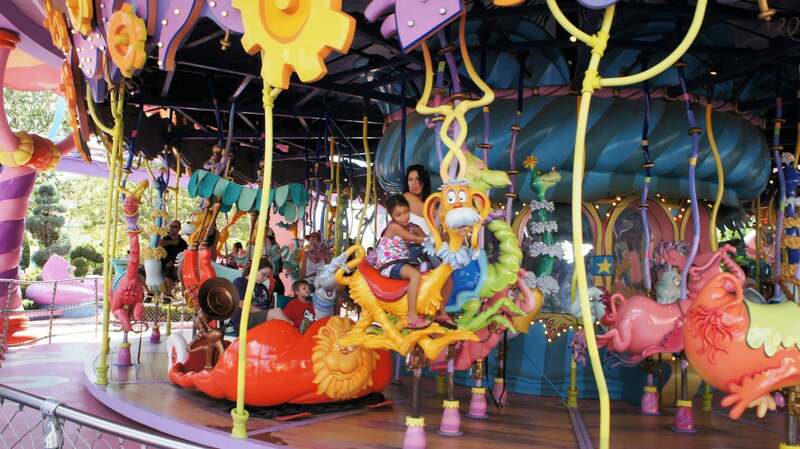 A parent may stand next to their child riding a character, but the parent must be standing between two characters, not on the outside or inside edges of the carousel. One Fish, Two Fish, Red Fish, Blue Fish is the next attraction in Seuss Landing. This is a fun ride for all ages. Stroller parking is around the viewing area of the ride. Express Pass are accepted at this attraction. Water squirts in an arch over your head while you are getting the ride. An adult and a child can easily fit into the attraction’s fish vehicle. After you begin to fly around using the handle for the fish to move up and down, be sure to listen to the song to help avoid getting wet. Next in Seuss Landing is Oh! The Stories You’ll Hear. This storytelling show is great for the entire family. Sit toward the front to get a good view. Most of the area is covered or shaded, but it does depend on the time of day. 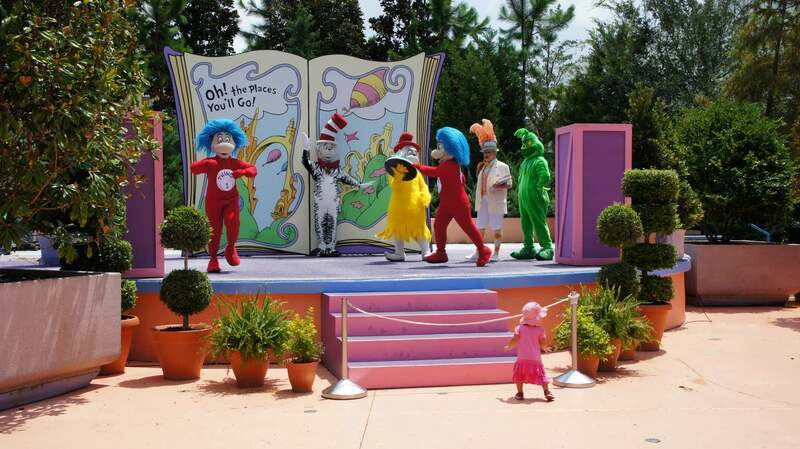 The stage show features Dr. Seuss characters including The Cat in the Hat, Thing One, Thing Two, Sam from Green Eggs and Ham, and the Grinch, along with the storyteller. The Lorax may also make an appearance when the storyteller chooses to read his story. There is singing and dancing, and the audience is encouraged to participate. After the show is over, all the characters are available for photo and autograph opportunities with the audience. Consult your park map for show times. Dr. Seuss characters also appear in this location during non-show times, so consult your park map for Seuss Character Zone scheduled appearances. The Cat in the Hat is another very popular attraction in Seuss Landing. Stroller parking is to the left of the entrance. Express Passes are accepted at this attraction. This indoor ride immerses you into the famous book and is very colorful and entertaining. Be aware that your car may spin all the way around so be sure to hold onto your loose items. One pleasant feature in Seuss Landing is McElligot’s Pool located next to The Cat in the Hat shop. This area is relaxing as it has waterfalls and Dr. Seuss characters in the water. However, it may be very sunny during part of the day. Another attraction in Seuss Landing is the If I Ran The Zoo play area. Stroller parking is marked at the entrance to the attraction. There is only one way in and out of this attraction. The play area for younger children is a lot of fun and has many hands-on activities, including a wet area. The entrance area is more like a maze, leading to climbing areas and the wet activities area. Your child can crawl in caves and slide through a tube. The wet area has a “river” (about an inch of water) that kids can step in. Kids can also can stand under a shower and play with various knobs and cranks that control water sprays throughout the area. The dry area floors of the playground are padded. After playing in the wet area, there is another section for hands-on play including riding a cow and squirting water at a Dr. Seuss character taking a bath. Look out for Scragglefoot Muligatawny who has a bad cold. If you or your little ones get hungry, thirsty or would like souvenirs from Seuss Landing, there are plenty of shops to visit. There are several kiosks located throughout Seuss Landing that sell food and drinks. Circus McGurkus is an indoor cafe with fun decorations that makes you feel like you are in a Dr. Seuss circus tent. Be sure to look up and notice that the Trolley Train will occasionally ride through the top of the circus tent. The Hop On Pop Ice Cream Shop, Snookers and Snookers Sweet Candy Cookers, and Goose Juice have delicious snacks and drinks. Green Eggs and Ham (open seasonally) has several meal choices including a green eggs and ham sandwich. All The Books You Can Read bookshop has a plethora of Dr. Seuss books and clothing for sale, including fun Grinch pajamas. Gertrude McFuzz Fine Feathered Finery and the Mulberry Street Store sell artwork, clothing and other souvenirs. Look for the little kid entrance on the right side of the Mulberry Street Store. The shop next to The Cat in the Hat attraction has a nice selection of items to purchase. The Zax By Pass is a not-so-well-known path where you can rest and relax and if your child needs it, take a nap in his/her stroller. You also have a great view of the lagoon from this path. This bypass is accessed by immediately turning left after crossing the bridge from the entrance area of Islands of Adventure into Seuss Landing. You will come out the other end of Seuss Landing just before the bridge into Lost Continent. 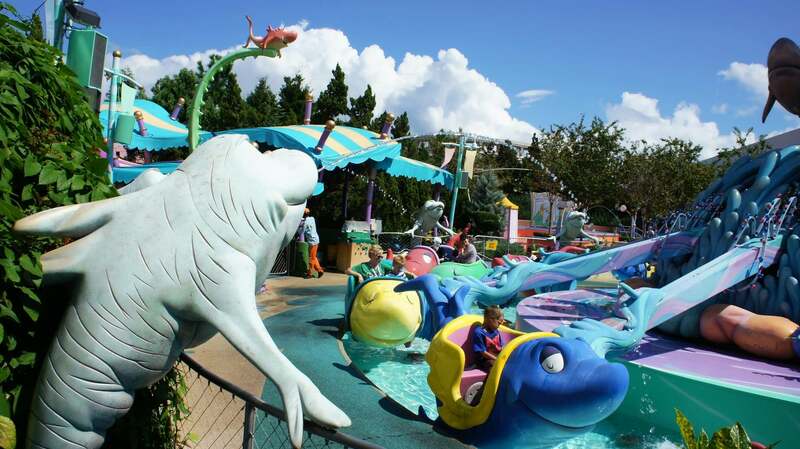 Outside of Seuss Landing there are ample rides and attractions available that do not have a height requirement. We recommend that you determine whether or not it’s appropriate for your kids as some of these attractions may be too intense for young children. Your child can meet and have their photo taken with Spider-Man and the Marvel Super Heroes. Consult your park map for scheduled times. Storm Force Accelatron, next to The Incredible Hulk Coaster, is ride for young superheroes. Express Passes are accepted. This is a spinning ride similar to Disney’s Tea Cups, but with loud music and flashing lights playing. Riders determine how much their vehicle spins so this may be okay for younger children. The Amazing Adventure’s of Spider-Man, one of the park’s premier attractions, has a height requirement of 40 inches (average height of a 5 year old). 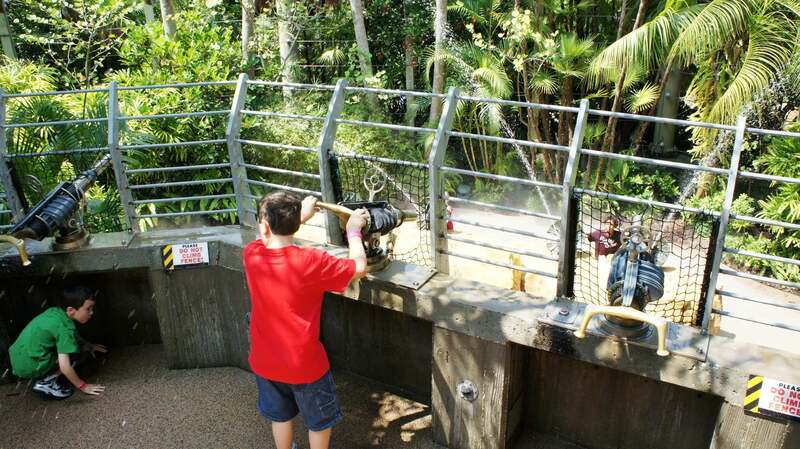 If your child meets the requirement and is a thrill seeker, this one is not to be missed. Me Ship, The Olive is a kids’ play area with a lot of fun activities including climbing on nets, sliding down slides and you can make the ship’s horn blow. This attraction has only one entrance and exit. Also, you have an awesome view of the park from the top floor of the ship. If you are unable to walk up the stairs, there is an elevator inside. On the second level you can shoot water at the guests below (and no quarters are needed). There are scheduled character greetings at the Toon Character Zone, which enable your child to have their photo taken with characters like Popeye and Olive Oyl. Consult the park map for specific times. Dudley Do-Right’s Ripsaw Falls and Popeye & Bluto’s Bilge-Rat Barges are two of the three water rides at Islands of Adventure, and both have a height requirement of 42 inches (average height of a 6 year old). 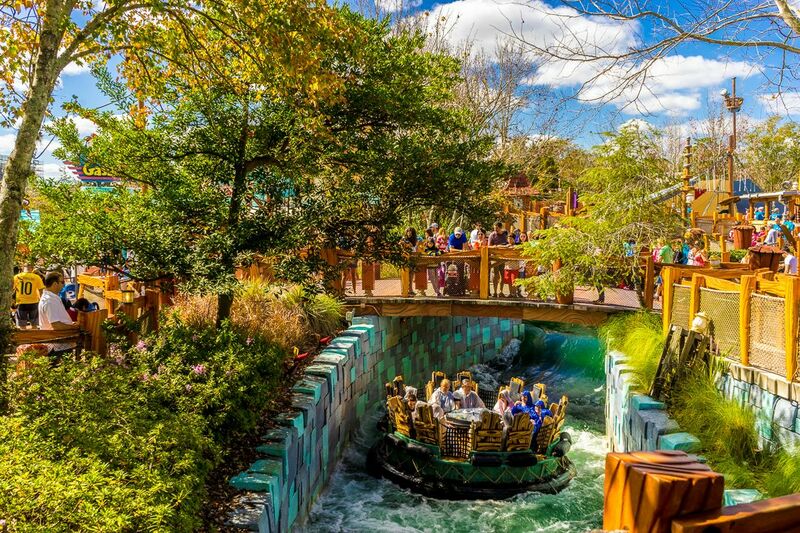 Ripsaw Falls features an aggressive plunge at the end, which may be a little much for younger kids – however, for Bilge-Rat Barges, the only thing to be scared of is getting soaking wet. Jurassic Park River Adventure has a 42 inch height requirement and may be too scary for young children, but children 6 to 9 may want to ride. Riders will come face-to-face with a T-Rex, plummet down what was once the highest water flume in the world, and may get soaking wet. Pteranodon Flyers is an attraction designed for children 36 inches or taller. You will “fly” under the wings of a Pteranodon and get a bird’s-eye view of the Jurassic Park area. The swing holds two people, one person in the front and one person in the back, and you are securely strapped in place. Another attraction that any child with a little energy will absolutely love is Camp Jurassic. Stroller parking is on the left before the entrance. This playground has a prehistoric theme and has some amazing features. However, it is recommended that preschool or some elementary aged children do not explore the camp alone. There are a variety of nets to climb and slides to go down. There are also numerous paths to explore (though they may be confusing to the very young, so look for directional signs placed on the edge of the foliage). The camp really makes you feel like you are in a jungle, with the sights and sounds and mist that appears. There is a water spraying section where you can shoot others above or below you, depending on what level you are on (see the image at the top of the page). Pteranodon Flyers exits into this camp near the area where there are various dinosaur footprints. Step on each footprint and listen to the sounds of the jungle. Jurassic Park Discovery Center is a hands-on interactive attraction that may be unappealing to very young children, but the 5-9 year old age range should find it fascinating. This attraction is located downstairs and can be accessed via elevator or stairs. Notice the huge dinosaurs located throughout the center. You can perform a variety of hand-on tasks including analyzing the contents of dinosaur eggs in the nursery, performing DNA sequencing, discovering dinosaur’s fossils in rocks, learning different habits and sounds of dinosaurs, and playing a Jeopardy-like game with dinosaur facts. Harry Potter and the Forbidden Journey ride has a height requirement of 48 inches, so the average child under 9 probably will not meet this requirement. However, take the tour of the attraction even if your child can not go on the ride at the end. The sights and experiences inside the castle are magical and amazing. Flight of the Hippogriff has a height requirement of 36 inches. Stroller parking is near the entrance to the ride. This kid coaster with a Harry Potter theme may not be intense, but it gives the rider quite a bit of a thrill, and would be a great first-time roller coaster. Notice that Buckbeak bows before you as your coaster starts to climb the hill. 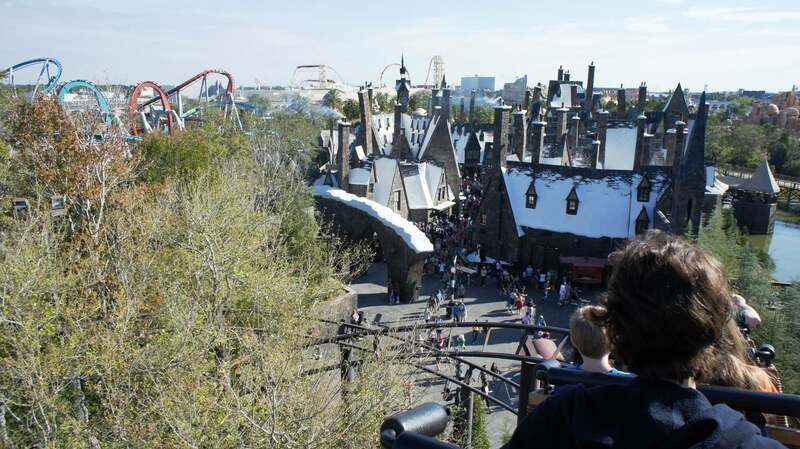 The rider also gets an excellent view of Hogwarts Castle and Hogsmeade Village at the top of the lift hill. View from the top of Flight of the Hippogriff. Children of all ages would enjoy the Frog Choir & Triwizard Spirit Rally. After the performance, there is a photo opportunity with the characters. Consult the park map for specific times. A very popular attraction in both Wizarding Worlds is Ollivander’s Wand Shop. Groups of approximately 20 people are admitted to the shop where one member is chosen to experience the wand selection with Ollivander’s assistant. This attraction really brings to life both the first Harry Potter movie and book when Harry was first selected by his own wand. The Hogwarts Express has no height requirement and is a pleasant, leisurely train ride through the Scottish countryside and downtown London. Many characters and locations from the Harry Potter films and books make an appearance. Once the ride is over, passengers disembark at the other Wizarding World of Harry Potter, in Universal Studios Florida (making this the most entertaining way to park hop). The interactive wand experiences located all throughout Hogsmeade allow children to stand at specially marked locations, flick their wands, and watch as magical effects transpire all around them. Please note that special interactive wands ($44.95) are required, and that some of the wand movements need to be rather exact – younger children may need assistance. In Lost Continent, the Mystic Fountain is great if your child wants to cool off and play in water. The fountain interacts with everyone around it and if you aren’t careful, it will squirt you. Throw a coin in the fountain and see what it does. Another attraction in the Lost Continent that does not have a height requirement is Poseidon’s Fury. It may be enjoyable for kids with a sense of adventure (or parents who want a break from the Orlando sunshine), but larger-than-life effects and pyrotechnics may make this one a bit too intense for young children. To learn more about planning the perfect family trip to Universal, check out Visiting Universal Studios Florida with kids.